Debbie started taking her craft of photography more seriously when the digital world starting taking off. A life long nature lover she always gravitated to capturing images of all things outdoors including animals and scenery. After retiring early from the Province of Manitoba it enabled her to travel more extensively to destinations that fulfilled her love of nature and spend more time on photography projects. 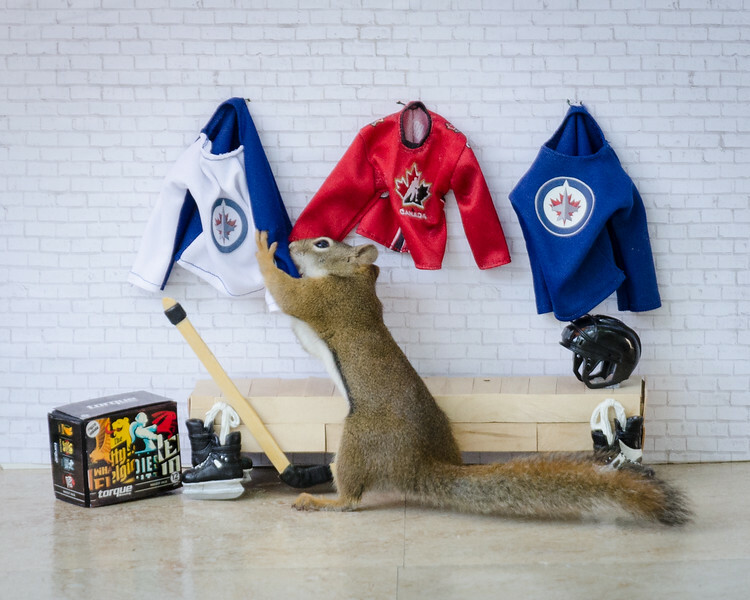 More recently Debbie created “ It's a Squirrelly World” project to fulfill her passion for animals, crafting and imagery making while incorporating her sense of humour. It's been a labour of love for her, from creating a vision, sourcing material, building dioramas, and waiting for the squirrels to arrive. She hopes that the next time you are cursing that saucy squirrel in your backyard you think of the images she made with her back yard squirrel. Debbie says, "Sharing doubles my joy of image making. Have a look at my website, enjoy and create your own stories. Put yourself there, and feel." Best of Friends Gift Shop at the Millenium Library, 251 Donald St. If purchasing art cards, calendars or pictures in multiples please contact her directly through her web site, debvokeyphoto.ca.